Machine to Machine (M2M) communication and the Internet of Things (IoT) is already starting to change ecommerce as everything from inventory to delivery trucks are being equipped with sensors that collect and share data via the internet. As Gartner reported in November 2015, “6.4 billion connected “Things” will be in use in 2016.” That’s a 30 percent increase from 2015. IoT is leading the growth in Customer Relationship Management (CRM) along with the cloud, social, mobile and big data. In addition, we’ve seen the price of IoT technology drop to affordable levels with IoT cloud services like Amazon’s “AWS IoT” and affordable chips like the “Intel Edison”. These changes are attracting tons of new application developers and entrepreneurs around the world as it paves the way for a whole new era of innovation. It’s incredibly easy to do. In just a matter of hours, I was able to set up my AWS IoT Cloud services with a backend Dynamo database, remotely collecting sensor data over the internet via a microservice from my Node.js enabled Intel Edison Wifi connected board. I could ssh into the board remotely and update the server code just like any other web application. The possibilities are endless. The Intel Edison chip on an Arduino board. Affordable and Easy to develop M2M and IoT programs with Node.js can send sensor data to your AWS cloud. Sensor collected data can be used to improve customer e-commerce experiences. IoT can add value across your whole e-commerce life cycle from inventory management to order fulfillment as well as help nuture customer relationships. For starters, IoT can help automate your supply chain management practices by providing passive inventory management and operations oversight. I remember the days of stocking shelves and hand entering stock levels onto a paper pad. Then we had to manually enter all the data into our computer database records. That’s too much room for error, especially when there’s multiple people managing the stock and entering the data records. Even costly barcode scanning devices and practices can be greatly improved upon by using IoT to more easily track inventory, providing meaning and valuable insights to your business records. An RFID tag can send an alert to your tracking system when an item leaves the warehouse. The tag can also increase efficiency in the warehouse and retail stores by providing real time inventory tracking. Imagine checking the temperature for perishable products and sending alerts when its too cold or too hot. Delivery trucks and warehouse machines can be equipped with sensors to monitor real-time operations and improve efficiency. This can also help improve maintenance and prevent downtime. An example is how UPS used sensors on their delivery trucks to reduce vehicle inspections 50%, from 240,000 preventative maintenance inspections per year down to 120,000. An article in Entrepreneur magazine describes how the data was used to negotiate with auto manufacturers, arguing warranty claims after collecting enough data to document a pattern where certain vehicle parts were wearing too quickly across their fleet. The next 3 advances in IoT technology are rather interesting because they build upon traditional CRM practices by incorporating realtime data from customers. They improve the shopping experience by learning about what customers want. The data collected from them can be used to better sell to them. You can also differentiate your brand from others when you customize their shopping experience by matching their observed behaviors and preferences to your product. Using IoT, companies can communicate in realtime by monitoring a vending machines inventory and maintenance. They can also direct customers to the nearest machines. One such example is Motivate’s NYC CitiBike, which captures data from bike share stations to help improve operations and to allow customers to know which locations have available bikes and empty docking stations. By using their web app, you can access system data to find the closet bike station and its bike inventory status. The next generation of vending machines offer companies to interact with their customers in the field. They can access a customer’s history and recommend products. The product preferences and sales history insights can even be accessed at a later time to provide recommendations to a customer online or in a brick and mortar store. Now let’s talk more about those customer insights. Imagine creating special sales and on demand pricing in real time to customers. You can send a promotion directly to their mobile phone in real time as they walk by or enter your store. Today, this is a reality, retailers can send a special deal to a customer based on the their shopping history, personal preferences, traffic, geolocation, as well as present weather conditions, and special events. American Express, for example, partnered with a bunch of retailers to offer realtime promotions based on a customer’s location and credit card activity. Data collected via IoT can considerably improve customer service with predictive analysis and by enabling proactive support. All you have to do is combine existing known models for support and maintenance along with customer information on status, location, functionality and preferences. Machine learning combined with realtime IoT data can enable the prediction of problems. Devices can also become self-aware, using back up resources and/or alert you when they need to be fixed. It’s awesome. The opportunities to develop new e-commerce strategies and technologies are endless. 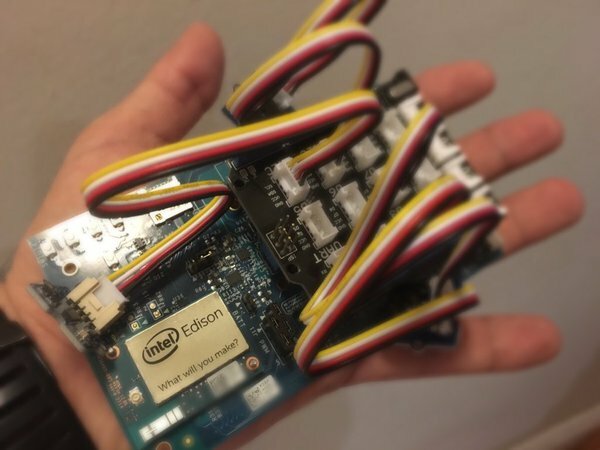 To echo the Intel Edison’s tagline “What will you make”?